"Color Management is a Windows 9/2000/XP feature that improves color rendition when you display an image or page on your monitor and print it on your printer. Color Management also allows you to preview, within the limitations of the monitor, how the image will look when printed on a specific color printer. Color profiles are installed when a monitor or printer is installed, and the profiles are used whenever colors are displayed or printed. For more information Color Management, please refer to your Windows documentation." ARRGGHHH. This is a tough one. I have not used color management so long I don't use it now. It muddies my pond water. BUT let's go over how PSP sets up color management and when and where you can benefit from it. Color management is a tricky thing, with many variables to set up to come out with a consistent and usable product. Start the color management process before ever opening PSP. On the windows desktop, look at the colors of the whites and greys. Are they true colors? Is there a blue or red or green tint in your whites? Is you navy blue really navy? Your Monitor profile and your graphics card need to be working on the same page. To tweak the basic color, right click an empty area on the windows desktop and pick Properties from the fly out box. On the Display properties dialog box are several tabs, go to the Settings tab on the right end. Make sure your monitor is set to at least high (16 bit) colors or True color in either 24 or 32 bit modes. Then make sure your video card is using the proper monitor profile. Depending on your graphics card, pick the tab for Color or press the Advanced button to find the Video card controls. Snoop around on the Dialog box for a Color tab, such as I have for the Matrox below. Use the sliders and whatever to tweak the colors on your monitor. In addition, most monitors have controls on the front allowing you to change basic color size/shape properties . Use these controls to tweak your monitor settings. Once you both the hard monitor controls and the video card options adjusted you are ready to use Paint Shop Pro and work within its color management. When you try this color management, click on the image below to open the larger version. Then save that image to your hard drive and use in PSP. 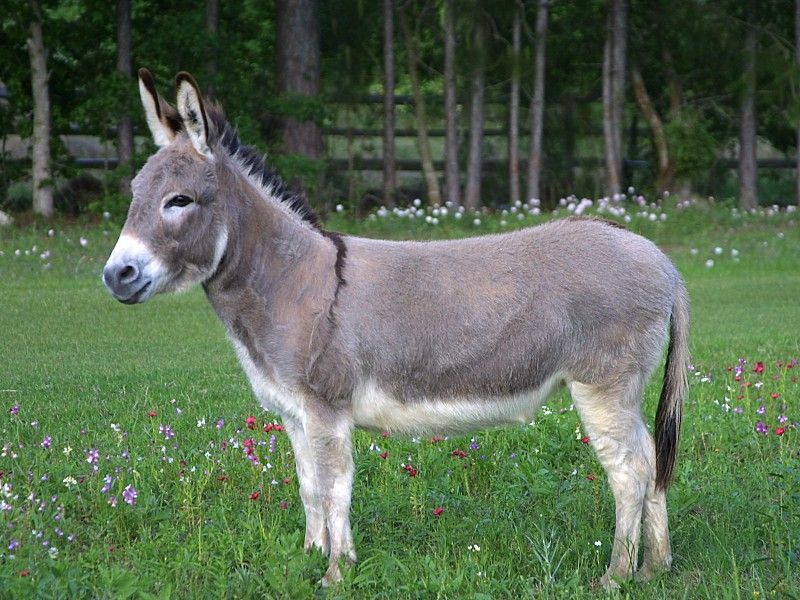 I am using DMD.jpg (Daisy Mae Donkey) because she has good greys, and colors like red and blue and green to test the printer on. This image looks just gorgeous on my monitor, without any color management, and the histogram shows a nice curve except that there are some blacks missing, (see the dark grey bar) in the histogram below, but we can fix that easily later. I like to work my color management on a good image, otherwise it will distort the process. So let's turn on some color management and see what difference it makes. In PSP, there are two things you can do to adjust your color management. Go to File > Preference > Monitor Gamma Setting on the Menu Bar. It helps to have an image open to use for comparison. So open DMD.jpg if you don't already have it open. DMD donkey is basically an OK image that will print fairly well without any color or tonal adjustments. "Monitors display colors by exciting phosphors to produce red, green, and blue light. Because these phosphors do not excite equally, they can produce distortions in the brightness, contrast, and color balance of images. For example, if a computer reads a lightness value from a photographic image and sends it directly to the monitor, the displayed color will be dimmer than in the original photograph. To compensate for this non-linearity of phosphor excitation, you can alter the color values sent to your monitor. Use the Monitor Gamma Adjustment to adjust the values." On the Dialog box are 4 squares with inner squares. See below. 1. Look at the red, green, blue, and grey color boxes on the left side of the dialog box. Each one contains an inner rectangle. The pixels in this area have a lightness value of 128. The outer area is a dithered pattern of pixels with lightness values of 0 and 255. 2. Drag a slider control to adjust its color box so that the inner rectangle and the surrounding area are of equal brightness. ... Select the “Link Channels” check box to adjust the levels in unison. ... Clear the check box to adjust colors individually. 3. Click OK to close the dialog box and apply the settings." The result though makes DMD look a bit blanched out. Let's go on to set the Color management stuff. On the Color Management Dialog box, Note the Image, Graphic, or Text generated by area.. at the top shows sRGBSpace. Yours will most likely say the same. Enable Color management... will be UNchecked by default. Check this box. See below. By default, the Basic Color Management: shows how colors appear on your monitor and printer options is on. This is the one you will use most, UNLESS you need to see how your image will print on another printer or output device. More on that in a bit. In the Monitor Profile box, your monitor should show up. Note mine is Iiyama HM90DT is shown. In the Printer Profile, the default printer, the Epson C -80 is shown. On the right side, rendering intent, should be set to pictures by default, so leave it there, because we are dealing mostly with picture. (And I cannot see any difference between the categories in the drop down box. ) See image above. With the default profiles set, press APPLY to see the changes in the image. Well now.. DMD looks just like she did before I set the monitor gamma! My theory is that most digital photos straight from a camera show a bit dark on a monitor, so to see it clearly adjusting the monitor gamma can show you the dark details on screen. But that same image probably will print out just fine on your printer. So when you subsequently set the Color management to on, it will show up on your screen darker, representing the actual output on the printer. Personally this bugs me. More later. Proofing shows how the image will look when you pick ANOTHER, usually offline printer, letting you make changes on screen to compensate for color shifts experienced in that printer. For example: Check the Proofing box. By default the same printer will be in the Emulated device box. Press Apply. Notice how the colors go all yellow. AND note, the image will print this way on your desktop printer. Try some of the other options in the drop down box. Some are papers, some are other color spaces, so are printers. I would only suggest you use Basic Color management choice, unless you are experienced in the color management area and have a specific printing need, not on your desktop printer! Set the color management back to Basic and press OK.
What difference do you see in this image and the previous one? Therefore, it appears that using Color Management negates the use of Monitor gamma! Therefore I would use only Color Management. :) Forget Monitor Gamma! Another way to tweak your colors when printing is to adjust the Printer Driver when you go to print. I have a profile set up on my Epson specifically to use for my Canon D-30 digital camera's images to get the best result on my C-80 Printer. After adjusting the image on screen, in this case with a Levels Adjustment layer and adding some unsharp masking on my background layer, my image is in prime shape to print. Go to File > Print on the Menu Bar to activate the Print Dialog box. My default printer the C-80 is listed in the Name box. On the Epson Stylus C80 Properties box, set the Media type. In this case Matte Paper Heavyweight. In the Mode box, check the Custom radio box, then press Advanced. On the advanced box, you have the option to tweak the color in several ways. I use PhotoEnhance 4. Check the radio box. On the tone I use Hard, and Effect Sharpness to medium. On the left side under Media Type and color or black, I set the print quality to 1440. Now because this prints wonderfully for me and my digital photos, I press the save settings box at the bottom. See image below. On the Save Settings box, I typed in Canon1 and pressed Save. Close out of the boxes to get back to the main Print properties box. When I press Custom radio box now I can pick Canon1 setting from the drop down box. And my prints will come out very wonderfully just about every time! Try it with your printer. You might have to tweak the printer driver settings several times to get an excellent print. Do several small prints, thumbnails, to determine which setting works the best. Then SAVE that setting for future use. Remember, start with a good quality image to get a good quality output. 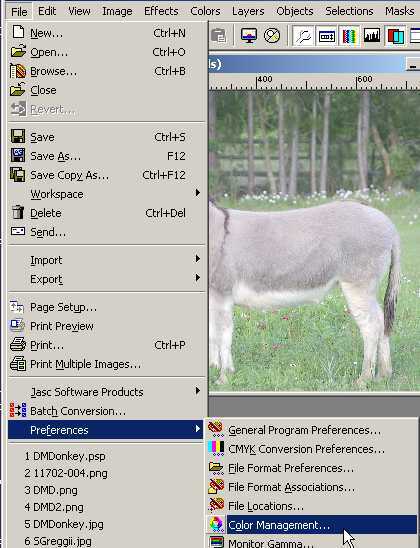 Adjust the image as well as you can onscreen then tweak the printer driver or use a saved setting and print. Once you have the image successfully print, save it in the PSP format to open later as a "model" for other images. Compare your current image to the "model". Match the tonal quality, color balance and sharpness of the current image to the successful "model" image and be confident of obtaining a perfect print! That's Khiba's Color Management theory, for better or for worse!